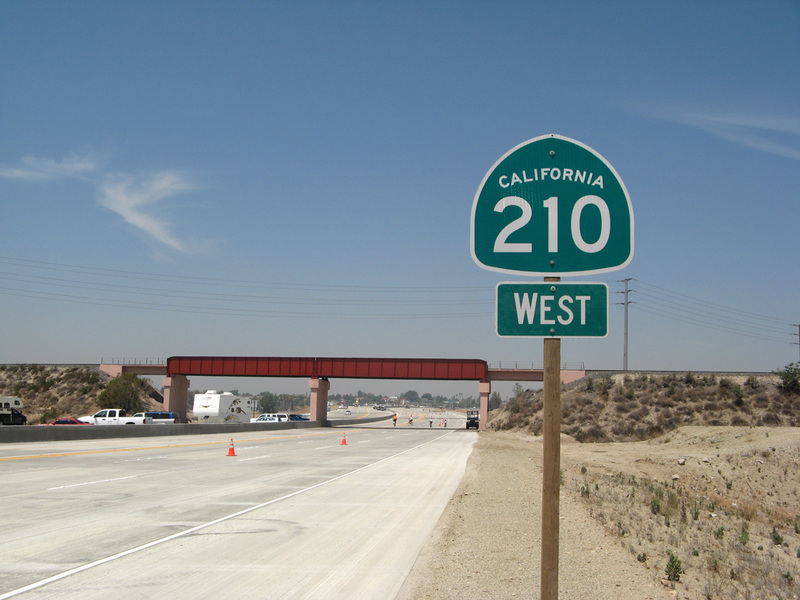 Reassurance shield for westbound California 210, posted between Muscoy and Rialto. This section was available for walkers and bicyclists on the “Come Play on the Freeway” event on June 24, 2007; the segment opened to traffic one month later. Photo taken by Andy Field (06/24/07). Interstate 210 in California is the Foothill Freeway between Interstate 5 (Golden State Freeway) in Sylmar and SR 57 (Orange Freeway) in Glendora via Pasadena. Interstate 210 changes into SR 210 at SR 57, and the state route continues east from there to San Bernardino and Interstate 10 in Redlands. The section between I-215 and I-10 was previously signed as SR 30. 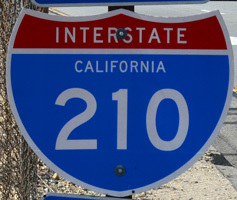 Although with the full freeway alignment of State Route 210 completed in 2007, Interstate 210 has yet to extend east from Glendora to San Bernardino. The process to add convert SR 30 to I-210 began in 1998, when the designation of Route 30 was legislatively changed to Route 210. Then on November 6, 1998, the state of California jointly submitted SR 30 for inclusion in the Interstate Highway System and for the removal of the section of I-210 between I-10 and SR 30. AASHTO rejected these proposals because the freeway segments were not complete. A spokesperson for Caltrans District 8 indicated that all signs should be updated to show Interstate 210 in place of SR 210 once upgrades are completed on the eastern extent of the freeway from Highland to I-10.6 The State Route 210 Mixed Flow Lane Addition from Highland Avenue to San Bernardino Avenue Project will expand the freeway from four 12 foot wide travels lanes with 5 foot inside and outside shoulders to six overall lanes between post miles R26.3 and R32.4. The overall project extends from post miles R25.0 to R33.2. Proposed Interstate 210 through San Bernardino County is part of High Priority Corridor 34: Alameda Corridor East and Southwest Passage. Interstate 210 (Foothill Freeway) was planned in the 1940s, commissioned in the mid-1950s, and completed in stages from 1969 to 1981. 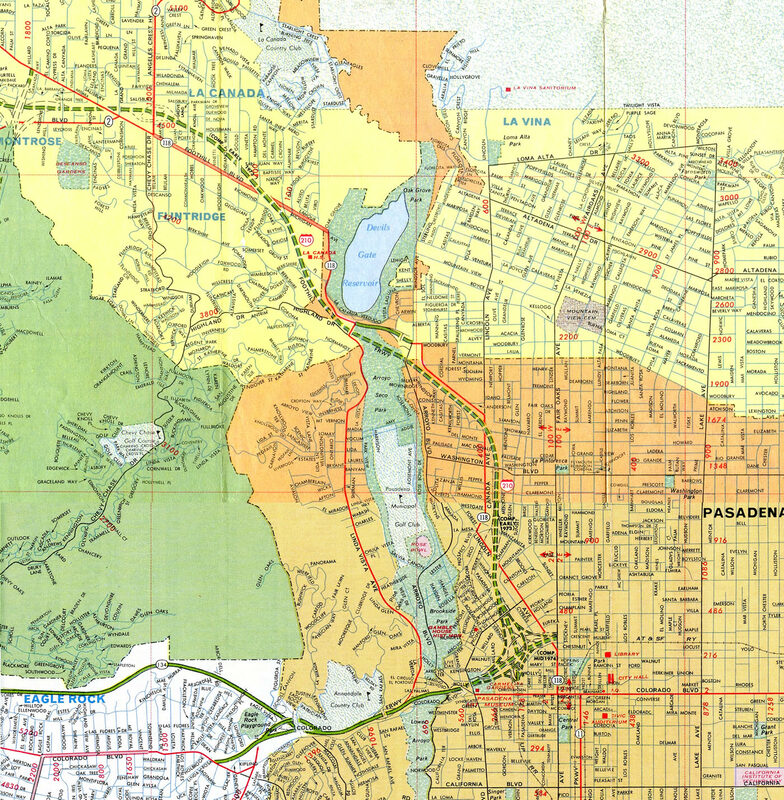 As sections of the Foothill Freeway were completed, the segments were signed as California 118 northwest of Pasadena and U.S. 66 east of Pasadena. Once the significant portions of the route were completed, Interstate 210 markers were erected. Prior to the conversion of the former California 30 corridor into California 210 in 1999, I-210 turned south from the Foothill Freeway at San Dimas to connect with I-10 at the Kellogg Interchange in Pomona. This section of the Orange Freeway was legislatively reassigned as Route 57. The first portion of the California 210 freeway opened in 2002 through Upland and Rancho Cucamonga. The subsequent section completed runs through Rialto and Muscoy. With the opening of the final link of California 210 east between San Dimas and San Bernardino on July 24, 2007,1 the combination of I-210 and California 210, offers a continuous freeway link from Los Angeles and the San Fernando Valley to Redlands. Signs for California 30 were removed in favor of California 210 in fall 2007. Fifth Avenue to Interstate 10 – 1984 and widened to second roadway in 1992. Prior to the spring of 1992, when the full facility was completed, California 30 — west to east — looked like this: freeway to the present Highland Ave. interchange in east San Bernardino, east on Highland to Boulder Avenue (the California 30/330 intersection), where it turned south. It went south on Boulder to 5th, then turned west on 5th to the freeway alignment, then went south again over the eastbound two lanes across the Santa Ana River watercourse, extending south to San Bernardino Avenue in Redlands. At that point, traffic was shunted off onto that street east to the east side of the freeway berm, where it turned south onto Tennessee Street (which had been extended north circa 1982-83 to serve as a frontage road for the California 30 freeway, as it does today) and thence to the Interstate 10 interchange. Some maps of that era showed California 30 temporarily extending east all the way to Orange Street (the original state highway alignment) then south to California 38 at Lugonia Street, where it terminated. While this may have been the officially designated alignment (Caltrans ceded the part of Orange Street that dipped into the Santa Ana River bed over to the local jurisdiction), signage from California 30 east directed traffic heading to Interstate 10 directly down Tennessee Street (and, if you have been that way and paid notice, there is room on the overhead signage for the Tennessee St. exits on Interstate 10 — in both directions — for a state highway shield). Signage from Interstate 10 to California 30, if my memory from the mid eighties serves me correctly, was rudimentary at best: I seem to recall nothing indicating California 30 at the Interstate 10 / California 38 / Orange Street interchange in central Redlands, but one solitary stand-alone sign before the Tennessee Street off-ramp reading, from top to bottom “TO”, California 30 (shield), “NEXT RIGHT” in a small square green sign under the shield. And that didn’t last long, since that was also the site of construction of the Interstate 10 / California 30 interchange, and the shield sat where Interstate 10 was being widened to accommodate the two-lane ramp exit to California 30. Exit 1C to Yarnell Street is the final mainline off-ramp from Interstate 210 preceding Interstate 5 (Golden State Freeway). Forthcoming Exit 1A will subdivide into ramps for the I-5 northbound general travel lanes and the truck bypass. Photo taken 07/03/04. The on-ramp from Yarnell Street forms an auxiliary lane to the southbound flyover for Interstate 5 (Golden State Freeway) south to Downtown Los Angeles. These porcelain-enamel signs date back to the opening of this section of the Foothill Freeway. Photo taken 07/03/04. I-210 curves southwest leading into the directional T interchange with the Golden State Freeway. Due to the 1971 Sylmar (San Fernando) earthquake, the Interstate 210 west to Interstate 5 south connector collapsed, and it was not rebuilt until 1975. Photo taken 07/03/04. An end shield for Interstate 210 precedes the southbound off-ramp to I-5. Caltrans District 7 is fairly consistent about placing end shields on its 1960s-1970s freeways; other examples of end shields include those at north end of I-605 and the north end of California 170. Photo taken 07/03/04. Traffic partitions for Interstate 5 north to Sacramento and California 14 (Antelope Valley Freeway) to Lancaster. Named the Golden State Freeway through the San Fernando Valley, I-5 follows Historic U.S. 99 as it crosses over Tejon Pass en route to the Central Valley. Once at Wheeler Ridge, I-5 angles northwest along the Westside Highway while California 99 takes over the Golden State Freeway en route to Bakersfield and Fresno. Photo taken 07/03/04. Exit 159B leaves Interstate 5 north for Roxford Street. The next exit along northbound is the transition ramp to Interstate 210 east, which travels around the city of San Fernando, then follows the Foothill Freeway southeast to Pasadena and San Bernardino County. Photo taken 08/26/07. Interchange sequence sign posted a quarter mile ahead of Exit 161A to Interstate 210 and the Truck Lane off-ramp (Exit 161B). Both the main lanes and the truck lanes offer a connection to California 14 (Antelope Valley Freeway), which travels northeast toward Lancaster, Palmdale and Mojave. Photo taken 11/25/04. Northbound Interstate 5 reaches Exit 161A for I-210 near Sylmar at the north end of the San Fernando Valley. This area is heavily industrialized, with significant concentrations of power, water and natural gas facilities. A large pump that carries Los Angeles Aqueduct water over the mountains is operates to the northeast of here, and a wide assortment of power lines feed into this area, including the main north-south line from the Central Valley, several lines from Hoover Dam, and another set from Owens Valley. Photo taken 08/26/07. Just beyond the departure of Interstate 210 east, I-5 partitions into four general travel lanes and two truck bypass lanes. Photo taken 08/26/07. Traveling south on Interstate 5 (Golden State Freeway), the first appearance for I-210 is on an interchange sequence sign posted after the on-ramp from SR 14 (Antelope Valley Freeway). San Fernando Road passes through this exchange, representing part of Historic U.S. 99, and also as one time business routes for U.S. 99 and I-5. Photo taken 08/26/07. Southbound travelers along I-5 enter the Los Angeles city limits ahead of Exit 161A for Interstate 210 east. 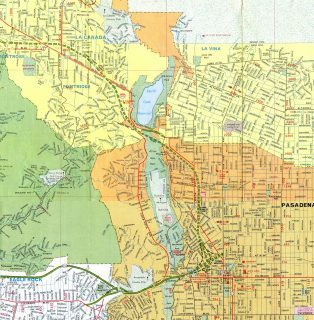 While I-210 directly replaced California 30, it also parallels the former alignment of U.S. 66 between Pasadena and San Bernardino. Photo taken 08/26/07. A flyover from SR 14 south forms the southbound beginning of the I-5 HOV lanes, three quarters of a mile ahead of Interstate 210 (Foothill Freeway) east. Photo taken 07/19/15. The right two lanes of the southbound general travel lanes on I-5 default onto Interstate 210 east. The Foothill Freeway initially encircles Sylmar before passing by the city of San Fernando. Photo taken 07/19/15. Balboa Boulevard spans Interstate 5 just ahead of the simulteanous departure of ramps from both the general travel lanes and the truck bypass to the three lane flyover for Interstate 210. Photo taken 06/15/13. Entering the directional T interchange (Exit 161A) with Interstate 210 (Foothill Freeway) east on southbound Interstate 5 (Golden State Freeway). Photo taken 06/15/13. Porcein button copy signs at the slip ramp joining the truck bypass lanes with Interstate 210 east. Photo taken 08/26/07. Replaced button copy signs along Interstate 5 north at Exit 159 for Roxford Street and Exit 161A for I-210 east. Photo taken 11/25/04. 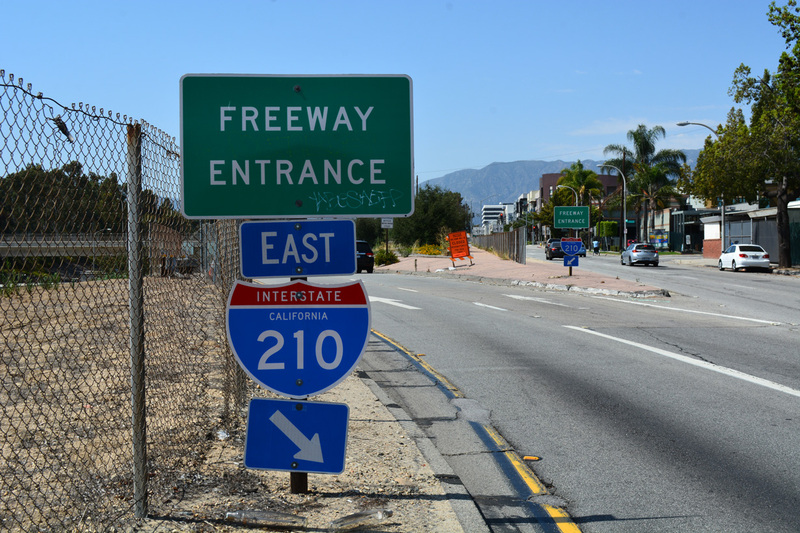 An exit number sign replaced this vintage assembly for Interstate 210 east. Photo taken 11/25/04. These button copy signs at the gore point for the I-210 eastbound ramp from the auto lanes were likely replaced in 2006 or 2007. Photo taken 09/25/05. I-210 east at Exit 43 for Sunflower Avenue, one mile ahead of California 57 (Orange Freeway) south to Anaheim and Santa Ana. Photo taken 11/14/04. The left four lanes plus high occupancy vehicle lane continue east on California 210, while the right lane exits onto southbound California 57. Photo taken 11/14/04. I-210 ends as traffic separates at Exit 45 for SR 57 (Orange Freeway) south. SR 210 continues the Foothill Freeway east to San Dimas, La Verne and Claremont. Photo taken 11/14/04. Northbound California 57 (Orange Freeway) reaches Exit 24B, Arrow Highway in San Dimas. The next two exits are Exit 25A, Auto Centre Drive and Exit 25B, California 210 east to San Bernardino. Note the greenout overlay on this sign for California 210. Two possible shields rest underneath the green-out overlay: California 30 … or Interstate 210. Photo taken 07/15/07. Northbound California 57 (Orange Freeway) reaches Exit 25A, Auto Centre Drive. Photo taken 07/15/07. Northbound California 57 (Orange Freeway) splits. The left three lanes follow Exit 25C to Interstate 210/Foothill Freeway west to Azusa, Duarte, Monrovia, Arcadia, Pasadena, La Cañada-Flintridge, Glendale, San Fernando, and Los Angeles. The right two lanes follow Exit 25B to California 210/Foothill Freeway east to San Bernardino via La Verne, Claremont, Upland, Rancho Cucamonga, Fontana, Rialto, and Muscoy. Photo taken 07/15/07. The first pull-through sign to refernece Interstate 210 west to Pasadena appears between the Foothill Boulevard and San Dimas Avenue interchanges. Photo taken 07/15/07. Westbound California 210 (Foothill Freeway) enters the city of San Dimas ahead of Exit 46. The two-wye interchange with I-210 west and California 57 south is mostly in Glendora, although the approach ramps are in San Dimas. Photo taken 07/15/07. Westbound California 210 meets California 57 (Orange Freeway) (former Interstate 210) at Exit 45. Prior to the freeway renumbering here, this interchange served as the western terminus of California 30, and Interstate 210 traveled southeast from here to Pomona and west to Pasadena. Photo taken 07/15/07. Button copy signs originally displaying I-210 and SR 30 were greened out to show both the extension of SR 57 north and the designation of SR 210 east. Photo taken by Pete Sison (04/27/03). The separation of California 210 east and 57 south. California 57 used to be signed as Interstate 210; those signed were removed and replaced with these reflective signs. Photo taken by Pete Sison (04/27/03). Replacement of this interchange sequence sign dropped I-210 freeway in favor of California 57 south. Photo taken by Pete Sison (09/27/02). Shields on these button copy signs were rearranged to reflect the renumbering of I-210 south as SR 57 and the decommissioning of SR 30.. Photo taken by Pete Sison (09/27/02). One half mile ahead of the California 30 westbound transition to Interstate 210 at San Dimas and Glendora. Photo taken by Pete Sison (09/27/02). Two lanes lowered from the Foothill Freeway (SR 30) west to I-210 east. Photo taken by Pete Sison (09/27/02). The final interchange sequence sign is posted on eastbound California 210. Photo taken 06/17/06. The left two lanes transition onto Interstate 10 east to Indio, Blythe, and Phoenix; the right two lanes transition onto Interstate 10 west to Los Angeles and Santa Monica. Photo taken 06/17/06. California 210 east concludes at the three-wye interchange with Interstate 10 (San Bernardino Freeway). Photo taken 06/17/06. Southbound California 57 (Orange Freeway) reaches Exit 22D, Via Verde and Raging Waters Drive. The next exit is the connection to California 71 (Chino Valley Freeway) south, followed by Interstate 10. Photos taken by Pete Sison (09/27/02). The right two lanes of California 57 (Orange Freeway) south will connect to Exit 22C, California 71 (Chino Valley Freeway) south to Pomona, Chino, Chino Hills, and Corona. The next exit is Exits 22B-A, Interstate 10 (San Bernardino Freeway). Photo taken by Pete Sison (09/27/02). Continuing south, a second sign advises of the lane configuration for the junction with Exit 22C, California 71 (Chino Valley Freeway) south to Pomona, Chino, Chino Hills, and Corona and Exits 22B-A, Interstate 10 (San Bernardino Freeway). These signs were all button-copy, non-reflective signs until Interstate 210 signs were removed through this interchange between 2003 and 2006. Photo taken by Pete Sison (09/27/02). Southbound California 57 (Orange Freeway) reaches Exit 22C, California 71 (Chino Valley Freeway) south to Pomona, Chino, Chino Hills, and Corona. The next exit is Exits 22B-A, Interstate 10 (San Bernardino Freeway). Photo taken by Pete Sison (09/27/02). Shortly thereafter, southbound California 57 (Orange Freeway) reaches Exits 22B-A, Interstate 10 (San Bernardino Freeway). The Kellogg Interchange is a symmetrical stack interchange. This off-ramp marked the former eastern terminus of Interstate 210. Photo taken by Pete Sison (09/27/02). Traveling north on California 57 (Orange Freeway), this is the first advance signage for the junction with Interstate 10 (Exit 21). Previously, the pull-through sign for California 57 was signed as Interstate 210 west Pasadena. That signage changed when California 210 was legislatively created to extend east to Redlands. Photo taken by Pete Sison (09/27/02). After traffic from Temple Avenue (Exit 20) merges onto northbound California 57 (Orange Freeway), the right two lanes become exit only for Interstate 10 west to Los Angeles and east to San Bernardino. The left three lanes will proceed north through the Kellogg Interchange to provide a connection to what is now Interstate 210 and California 210. Photo taken by Pete Sison (09/27/02). California 71 northbound at the eastern Interstate 10 off-ramp. California 71 continues northbound to Interstate 10 westbound and a transition onto California 57, which was formerly signed as Interstate 210 west. Photo taken 05/02/02. Two lanes continued north from California 71 to Interstate 210 west beyond the ramps for I-10. Photo taken 05/02/02. Continuing north, the left two lanes connect California 71 to California 57 (Former Interstate 210), and the right lane connects to Interstate 10 (San Bernardino Freeway) west to Los Angeles. Photo taken 05/02/02. Interstate 10 eastbound at the ramp for Interstate 210 westbound and California 57 south. California 57 heads south towards Anaheim while Interstate 210 heads north before turning west at Glendora. The Kellogg interchange is visible in the background. Photo taken 05/02/02. Interstate 10 east next reaches the ramp to Exit 42B, California 71 (Chino Valley Freeway) south to Pomona, Chino, and Corona. The four-level stack Kellogg Interchange sits on top of Interstate 10, which forms the lowest level. Photo taken 03/25/05. Parker, Scott. Personal Email: “210 Opening Next Week,” July 20, 2007. Parker, Scott. Personal Email: “RE: 210 opening next week,” August 15, 2007. Moon, C.J. Personal Email: “210 Dates,” August 25, 2007. Twiss, Adam. Personal Email: “RE: Interstate California 210,” August 15, 2007. “Why isn’t the new section of the 210 Freeway called Interstate 210?” Inland Valley Daily Bulletin (Rancho Cucamonga, CA), September 16, 2018. “Full-speed ahead.” Highland Community News (CA), April 11, 2018.